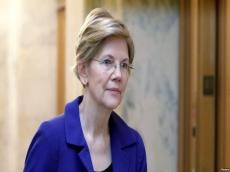 US Senator Elizabeth Warren, struggling to move past criticism over her claims of Native American heritage, aimed for a fresh start on Saturday with the formal launch of her 2020 presidential campaign, saying that she is fighting for all Americans, Trend reports with reference to Reuters. The Massachusetts Democrat, a leader of the party’s progressive wing, made her announcement from a historic site in Lawrence, northwest of Boston, that launched the US organized labor movement. Warren, 69, has made worker rights, fair wages and access to health care central to her campaign. Warren’s announcement will be followed on Sunday by US Senator Amy Klobuchar, who has said she will reveal her presidential plans in her home state of Minnesota. Warren and the other women running so far, among whom are Senators Kamala Harris and Kirsten Gillibrand, are hoping to build on the success of women candidates who played a significant role in Democrats regaining control of the US House of Representatives in November’s congressional elections. Warren heads next to Iowa, where fellow Democratic contenders US Senator Cory Booker and Pete Buttigieg, the mayor of South Bend, Indiana, campaigned on Friday.